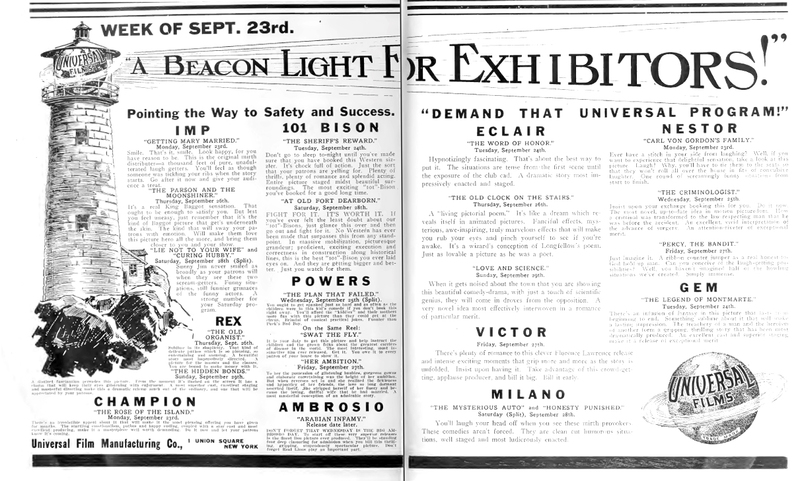 New York Motion Picture Company production; distributed by The Universal Film Manufacturing Company, Incorporated [101 Bison]. The Universal Film Manufacturing Company was founded on April 30, 1912, in New York. Chicago’s Carl Laemmle emerged as president in July 1912. This was the first film produced at the Universal City studios. Reviewed by G. F. Blaisdell. killed. Two men who had been wounded were also slaughtered. The Indians then divided the plunder and burned the buildings. The fort was not rebuilt until 1816. The foregoing is history. 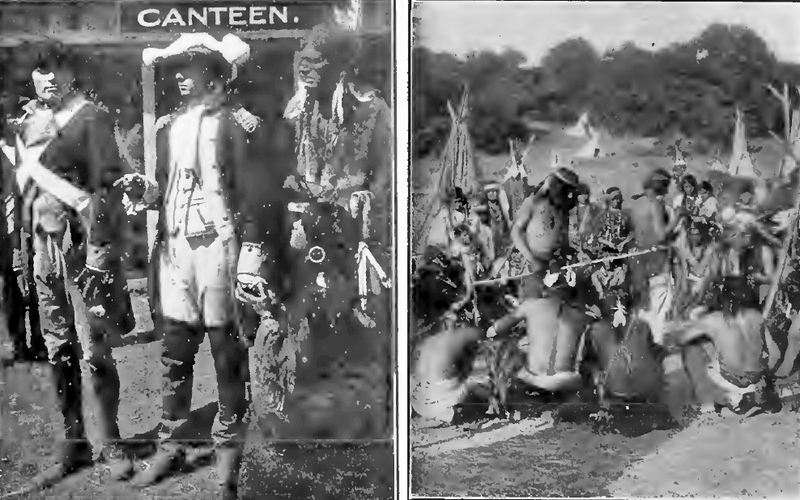 The Universal Film Manufacturing Company has produced two reels entitled “At Old Fort Dearborn, or Chicago in 1812,” in which this series of events is vividly portrayed by a big company, including a large band of Indians. Frank E. Montgomery was the man behind the guns, and in the opinion of those who saw the initial presentation of this film he has outdone his fine work in the “Santa Fe Trail.” Mr. Montgomery evidently is a believer in the pictorial value of big areas—of spreading landscape— wherein the camera has wide sweep of knoll and plain. That the producer of these big Universal Bisons has struck a popular note is beyond question. The motion picture follower is essentially a member of a more or less closely settled community. To him these broad vistas peculiarly appeal. Little Mona Darkfeather is the star of this production as Singing Bird, the daughter of Black Partridge, a Pottawatomie chief; she has a role that will prove to be a popular one—that of a friend of the soldiers. In this picture she accomplishes another of her remarkable vaulting mounts. It would be at least difficult offhand to name among the many accomplished riders in picturedom her peer as an all-round horsewoman. Very likely mature reflection would not bring the question any nearer solution. To Charles Bartlett, as Dan Rawlins, a renegade, falls the “heavy” work; he has plenty to do. He does it well. He rouses the Indians to real enthusiasm in his appeals to them. The story opens inside the stockade at Fort Dearborn. Black Partridge visits Captain Heald. With the chief is his daughter. The chief has called to return to the White Father the Madison peace medal which he has worn as a token of amity with the whites. The Indian informs the commander of the fort that his people are out for war and that he cannot control them. While the Indian and soldiers are conversing, Rawlins, drunk, reels into the stockade and embraces Singing Bird. He promptly lands in the guard house, being taken away from the little Indian girl by Captain Heald. Rawlins sets to work to burrow his way out of the guardhouse, and very shortly accomplishes his escape. He appropriates a horse and is making fast time away from the fort when he falls into the hands of the Indians, who are on their way to the fort to avenge the insult to Singing Bird. States. Captain Heald is directed to take his people to Detroit. Rawlins has been successful in his harangues to the Indians. Singing Bird, under obligation to Captain Heald for his interposition in the drunken revelry of Rawlins and doubly antagonistic to that good-for-nothing, goes to Captain Heald to inform him of the situation. The commander does not take the warning seriously. Mr. Kinzie, the old settler, wiser in the ways of Indians, advises the captain to get away as soon as possible. Heald accepts the Indians’ offer of a safe conduct. The soldiers and the settlers, accompanied by a delegation of Indians, pass out of the stockade and set out for their long journey. The Indians under the leadership of Rawlins are on the watch for the caravan. As the whites begin to go into camp for the night, their great covered wagons forming in a circle, the signal is given and the attack begins. The redmen who had heretofore acted as a convoy now join their brothers in the assault on the whites. The battle is short, as the soldiers are greatly outnumbered. Captain Heald is taken prisoner. His wife is saved by Singing Bird, who has been following the band of Rawlins in the belief that mischief was brewing. The little Indian girl, by the use of a tomahawk on the chief who is trying to capture the wife of the commander, has been able to put Mrs. Heald, wounded, on the back of her pony and ride away with her. She leaves her in a tent in an isolated place and returns to the Indian village. The Indians set fire to the fort and then return to camp. Captain Heald is bound to a stake by Rawlins, with some cuffing that might very well have been omitted. Singing Bird goes to Black Partridge and begs for Heald’s freedom. The old chief has been opposed to the conflict with the whites, he has lamented the surrender of his peace medal, but he is too wise to sanction any such move. He refuses the request. As night falls Rawlins places an Indian on guard over Heald. In the camp street the Indians are gathered in a circle, not many feet away from Heald. Singing Bird comes out of her tent with a water jug. The guard asks for a drink. The girl goes to a stream and fills the jug. Into the water she puts a poisonous plant. The redman drinks the water and is soon unconscious. Singing Bird takes his knife. The others are asleep. She cuts the bonds of Heald. The two leave the ramp together and proceed to the tent where Mrs. Heald has been placed. Singing Bird guides them to a canoe and the three embark. When Rawlins discovers that his prisoner has escaped, the prisoner who had been the instrument of placing him in the guardhouse and on whom he had fully expected to take more than ample revenge, lie calls all available men in the camp for the pursuit. The trio are followed down to the waterfront, and are discovered within gunshot. Singing Bird is wounded, but the captain and his wife are not struck. The Indians are left behind. The fugitives, after coming ashore, are found by soldiers from Fort Wayne. Singing Bird’s wound is fatal. Just before her death she confides to Mrs. Heald that she loves the white chief. So the little red woman, like so many of her white sisters and like so many of the white sisters’ brothers, had had her secret romance. In the cast of Pioneer Days are Kathlyn Williams, Lafayette McKee, Charles Clary, William Syowell and others. This is a historical drama about the Fort Dearborn Battle filmed in Wilmette, Illinois, it was one of the last films produced by Selig Polyscope. Winnebago women, actresses in Pioneer Days, relax with a gambling game on location in Wilmette, IL during the filming. 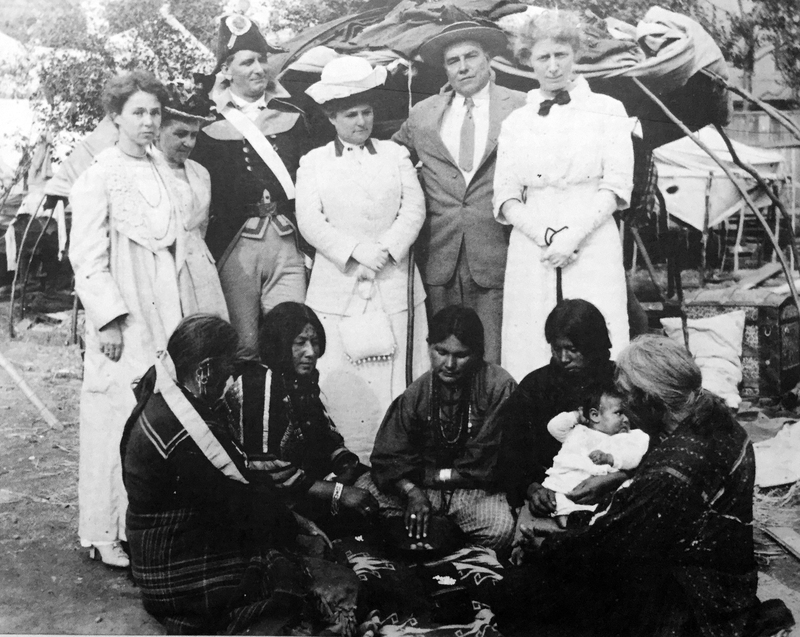 The group watching them includes Martha Heald Johnson, dressed as her ancestor Captain Heald, whose part she played and, at the extreme right, Caroline M. McIlvaine, librarian of the Chicago Historical Society, who worked as consultant to the Selig Polyscope Company during the making of this film.